Price Ford of Turlock is proud to announce its next fundraising event taking place on Saturday, May 12th at the Denair High School campus. In collaboration with the local community, Price Ford of Turlock is conducting a Drive One 4 UR School program in an effort to raise up to $8,000 in funds to benefit Denair Sports Boosters, Sober Grad and Denair’s FFA Boosters. Price Ford has hosted several Drive One events over the past few years, raising tens of thousands of dollars for local schools including Turlock High School and Pitman High School. 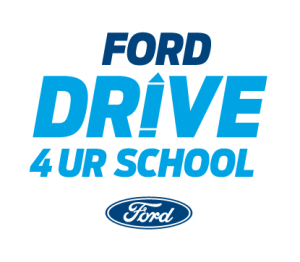 “Denair High School is fortunate to partner with Price Ford during their Drive One 4 UR School event. The funds raised will benefit the Denair High School Sober Grad, Athletic and Agriculture departments. Our students will benefit immensely from this event,” said Kara Backman, Principal of Denair High School. 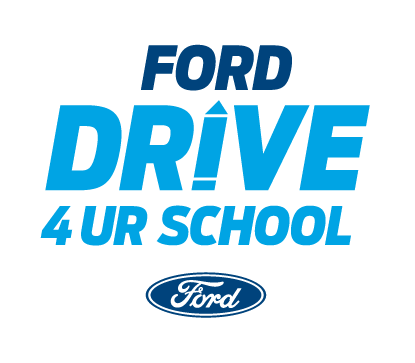 Price Ford’s upcoming Drive One 4 UR School event will be a fun, engaging way to raise money for the local high schools. With each test drive of a new Ford vehicle, funds will be donated directly to the Denair High School Sports Boosters, Sober Grad and the FFA Boosters. No donations will be asked of the participants. 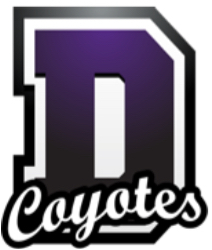 “We are excited to be partnering with Denair High School for the first time. This Drive One promotion will be a great day of fun test drives and no salespeople – all for a great cause,” stated James Figurell, owner of Price Ford of Turlock. As a part of the dealership’s commitment to its neighbors, Price Ford continues its mission of providing vehicle shoppers and vehicle owners the buying and service experiences that are easy, affordable, transparent, and set the standard for business excellence. The store supports community causes where passion and purpose come together. Attendees will have all the fun, but the boys and girls athletic programs at Denair High will be the big winners at Saturday night’s annual Sports Boosters Fundraiser. The event begins at 5 p.m. Saturday at the Denair Community Center. 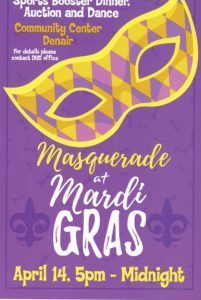 Tickets are $50 per person and include a steak dinner, free wine and beer, live and silent auction items, a dessert table and a live band. 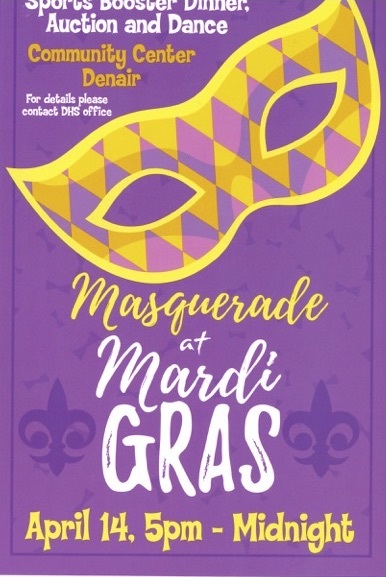 The theme is “Masquerade at Mardi Gras,” so bring your New Orleans mask and dancing shoes. All proceeds go to supporting the Denair High sports programs. To become an event sponsor or to donate any auction items, please call Tim Fanning at (209) 380-8180. 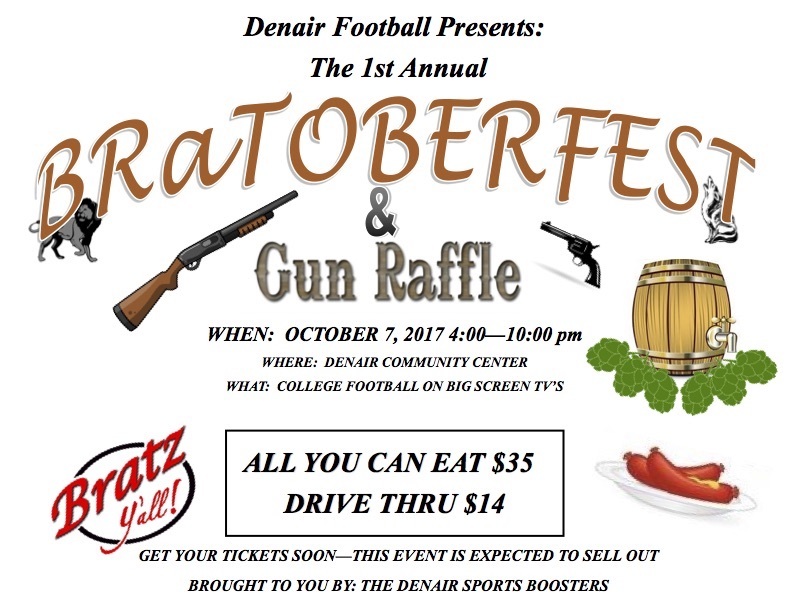 On Saturday, October 7, 2017, Denair Sports Boosters will be hosting it’s First Annual Bratoberfest & Gun Raffle from 4:00 pm to 10:00 pm, at the Denair Community Center. They will be serving a variety of Bratwurst, along with sauerkraut, potato salad and a selection of beer for a traditional Octoberfest style celebration. Big screen TV’s will be broadcasting college football throughout the evening, as well as a variety of gun raffles. Tickets are $35 for all you can eat and drink. Proceeds from the event will benefit Denair Football. Tickets are available by calling (209) 380-8180, or at the door the day of the event. The 8th Annual Denair Sports Boosters Dinner/Auction Fundraiser will take place on April, 16 2016 at the Denair Community Center,in Denair California. The event has become a don’t-miss affair, attended by alumni, current and past teachers and administrators, as well as, local community leaders. The proceeds from this event have helped the student athletes of Denair High School in a variety of ways. The school has been able to outfit their athletes with state-of-the-art equipment; pay costs associated with travel; pay officiating expenses as well as make improvements to the physical plant, i.e. field improvements and regular maintenance. The original event took place in 2009 and has proven to be the premier social event for the community. With the support of a group of dedicated volunteers, we expect this year’s event to better than ever. 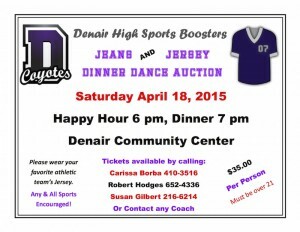 Denair High School Sports Boosters are hosting a Jeans and Jersey dinner, dance and auction on Saturday, April 18, 2015. Happy Hour starts at 6:00 pm, with dinner following at 7:00 pm, at the Denair Community Center. Attendees are encouraged to wear their favorite athletic team’s jersey to the event. Tickets are $35.00 each and attendees must be at least 21 years of age to attend. Tickets can be purchased by calling Carissa Borba at (209) 410-3516, Robert Hodges at (209) 652-4336 or Susan Gilbert at (209) 216-6214. Additionally, you may contact any DHS coach for tickets.